In the world of comic books, "troublemaker" means someone who has some sense of dignity. 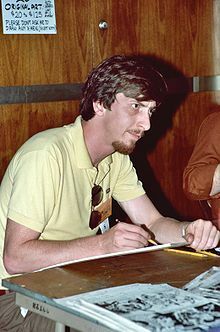 Frank Miller (born 27 January 1957) is a comic book writer and artist. He's clearly a man with a mission, but it's not one of vengeance. Bruce is not after personal revenge... He's much bigger than that; he's much more noble than that. He wants the world to be a better place, where a young Bruce Wayne would not be a victim... In a way, he's out to make himself unnecessary. Batman is a hero who wishes he didn't have to exist. About Batman's motives, as quoted by David Mazzuccheli in his Afterword to Batman: Year One. I don't think so. ... Well, let's put it this way. This month, I don't think so. It's been a long couple of months. My Sin City heroes are knights in dirty, blood-caked armor. They bring justice to a world that gives them no medals, no praise, no reward. That world, that city, often kills them for their brave service. For some reason, nobody seems to be talking about who we’re up against, and the sixth century barbarism that they actually represent. These people saw people’s heads off. They enslave women, they genitally mutilate their daughters, they do not behave by any cultural norms that are sensible to us. I’m speaking into a microphone that never could have been a product of their culture, and I’m living in a city where three thousand of my neighbors were killed by thieves of airplanes they never could have built. It is, not to put too fine a point on it, a piece of propaganda ... Superman punched out Hitler. So did Captain America. That's one of the things they're there for. I can tell you squat about Islamism. But I know a lot about Al Quaeda, and they need to burn in hell. Talk about w:Holy Terror and response to accusations of racism. American comics are so constipated. I think it's quite enough to simply be sarcastic about something. I like to do that quite a lot, and it's one of my favorite things to look at. That's why I think there's a thin line between melodrama and satire, and I like to dance across that line sometimes. I like the story to take a very funny turn or have a character who is much more of a cartoon. If ever there was a theme song for the business end of the industry, it's: "We can't do that; we didn't do that yesterday."